This is going up a whisker late on my side of the world as I had a busy day yesterday. Anyway, this shot was taken in my apartment. 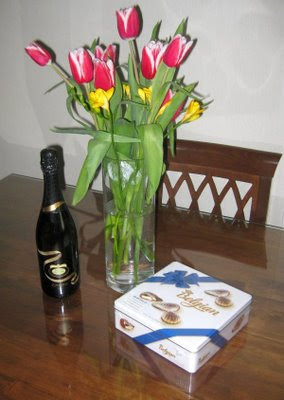 I thought that the chocolates from Belgium, the sparkling wine from Australia and the flowers with a Dutch connection gave this an international flavour.